Bangalore Metro Rail Corporation Recruiting 69 Assistant & Executive Engineer Posts on Feb 2015. 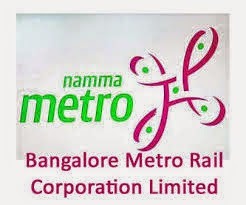 Hiring Organization : Bangalore Metro Rail Corporation Limited. Age Limit : Candidates age should not exceed 55(Dy.chif/DY.General Manager) and 50(other posts) years. Age Relaxation will be applicable as per the government rules and regulations. Educational Qualification : All Interested candidates should have completed B.E/B.Tech, M.E, B.Arch, M.Arch, or equivalent qualification from a recognized university / Board. How TO Apply : All Eligible and Interested candidates are requested to visit official website http://www.bmrc.co.in After filling, The hard copy of application will be send along with relevant testimonial (Mentioned in Detailed Advertisement) to the following adders On or Before 21-02-2015. K.H Road Santhinagar, Bangalore- 560027. Important date to remember : 21-02-2015. Click Here for BMRC Recruitment-2015 Job Full Advertisement To Download.